While there are many different versions of the Navajo origin myth, general aspects of the myth are present in all versions. In the beginning First Man, First Woman, and Coyote journey through multiple worlds, each distinguished by a color. The journey begins in the lowest level where the inhabitants have all the means to be happy, but arguments and violence develop. The anguish becomes so great it begins to destroy the world by water and the characters escape into the next world by climbing up into a hole in the sky. However, in this new world chaos eventually reigns once more, and the destruction and escape process is repeated. In each world the characters meet new helpers who travel with them. Eventually the group emerges on earth’s surface, which is a markedly different world than the others. The earth is covered in water and controlled by water birds. These birds are defeated in contests and the four winds drain the world. First Man and First Woman spend time planning how to build this new world. Their first actions are to create holy people that are humanlike and to build the first Hogan with the power of their medicine pouch. First Man then completes a night-long ceremony where he creates a world where there is beauty, balance, and order. It is into this world their child, Changing Woman, is born. Later on, it is Changing Woman’s twin boys, Monster Slayer and Born for Water, who defeat the monsters in this world and make it safe for people to live in. 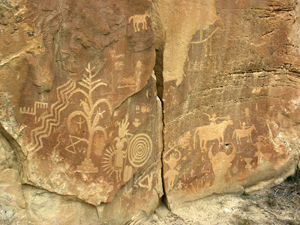 Main panel at Crow Canyon Archaeological District, northwest New Mexico, showing Navajo deities, plants, and animals, November 28, 2006" by camerafiend. 1983 Navajo Views of Their Origin. In Handbook of North American Indians, Vol. 10. A.
Ortiz, ed. Pp. 502-505,Washington: Smithsonian Institution Washington. Personhood. Tucson: University of Arizona Press.